At the Berbera container port in the internationally unrecognised state of Somaliland, employees of Dubai-based DP World unload 40-foot crates from a hulking cargo ship as more vessels wait on the horizon. That a global port operator is preparing to spend such a large sum in a state that is not recognIsed by the UN or anyone else is a stark example of the political and commercial battle taking place in the under-developed Horn of Africa — a gateway to lucrative trade routes through the Suez Canal and the fast-growing markets of Africa. It is also a testament to the relative stability that Somaliland’s isolated government has achieved since breaking away from Somalia 27 years ago. The new DP World investment comes at a time when Middle Eastern states including the United Arab Emirates, Saudi Arabia, Turkey and Qatar are projecting greater political and economic power in the Horn of Africa region. This year the UAE pledged $3bn in aid and investments to Ethiopia and played an important role in negotiating a historic peace deal between the country and its neighbour Eritrea. The UAE has also extended its military reach by building a naval base at the Eritrean port of Assab. It has similar plans for Berbera, where it is constructing an Emirati air force base and a harbour. The facility is just five miles from DP World’s port, though the company said there was no connection between the military agreement and their commercial investment. Part of the prize at Berbera is its proximity to the fast-growing economy of Ethiopia to the west. Ethiopia’s gross domestic product has risen tenfold in the past 15 years to more than $80bn but the landlocked country relies on a single port in Djibouti to manage more than 90 per cent of its trade. To reduce this dependence Addis Ababa this year announced it would take a stake in Berbera alongside DP World and the Somaliland government. But DP World’s Mr Sulayem said Ethiopia and the wider region still needed a further ten modern ports at least to keep pace with expected economic growth. DP World’s commitment to Somaliland is driven, in part, by the collapse in its relations with Djibouti to the north, where until this year it ran the Dolareh container terminal, the only modern port along this section of Africa’s coastline. In February, Djibouti seized Doraleh after accusing DP World of deliberately under-using the port in favour of Berbera and other regional terminals. Yet the push into Somaliland, is not without risk. 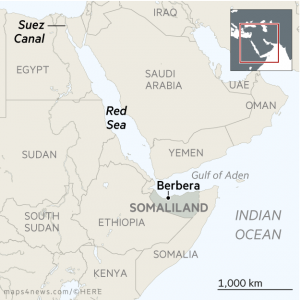 The government in Somalia to the south opposed the DP World deal and as long as Somaliland’s independence is not recognised, Berbera remains part of Somalia under international law. Muse Bihi Abdi, Somaliland’s president, said Somalia had no power to interfere with its ports or boundaries and that DP World’s investment would help the country to achieve international recognition. Somaliland declared independence from Somalia in 1991 but despite achieving relative peace and stability and holding regular elections, it has struggled to attract investment given its status as an unrecognised state. “DP World is a big international company who dared to come to Somaliland and I hope a lot of other companies from other countries will follow,” Mr Abdi told reporters in Hargeisa. The partners plan to establish an economic area next to the port to attract manufacturers in the mould of the Jebal Ali free zone in the UAE, which hosts some 7,500 businesses employing more than 150,000 people.